Dang... V and I must be getting our domestic on today, because along with cooking up a storm in the kitchen, we decided to plant our herbs on the deck. It is nice to break for a fun day of complete domesticity sometimes. She often will call them weeds but is now starting to learn their names with the accompanying signs. By the way, aren't those signs cool? I scoured all over the web looking for something like them last year, and came up with nothing. My lovely friend Stephanie surprised me with them for my birthday this year and yep, she picked them up in France -- so big bummer, but I don't have a source for you. If you have never done herbs before, I would highly recommend it. They run about the same price to buy the starts as they do to buy fresh recipe ready ones in the grocery store and they usually yield much more. If you live in a small space you can plant them on your deck like us, or in a garden plot, and fresh herbs make a load of difference in a recipe. I am not the biggest green thumb (still learning) but for the last three years I haven't killed any of our herbs yet, they are super easy. Each year I pick a different variety, and this year I decided to focus practically upon the herbs that we really use most in the kitchen. Do you grow herbs? What are your favorites to grow? Love your herb pot! I cycle through different ones, but mint, basil and oregano are pretty constant. I'm a windowsill gardener, but I dream of having a small plot to try tomatoes and other veggies on! Your herbs look lovely. I need to cultivate my own herb garden and am using your post as inspiration! Keep your eye on the mint because it will TAKE OVER. A separate pot might be better just so you can keep it contained, unless you used a miniature variety. If that's the case then kindly disregard the above! Love the adorable signs. I have a barrel planter outside my side door that I use for herbs. The last couple years, I've limited it to just basil and cilantro, because that's what I use again and again all summer long. 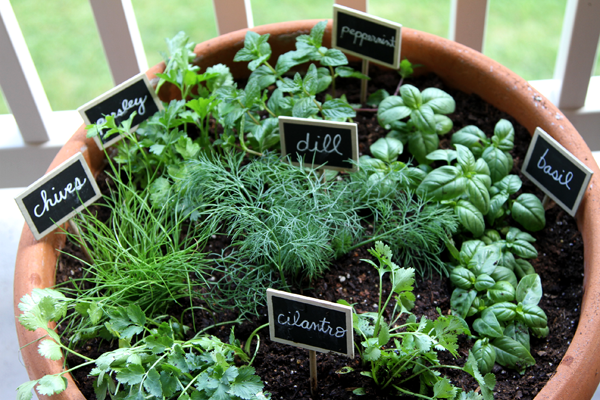 There is nothing like having fresh herbs, and you're right - so easy! we have SO many snails in our backyard that I don't have much out back besides Rosemary, which is more for aesthetics. I've been toying with doing an inside garden, but my kitchen and kitchen window are so small I'm not sure it's doable. Found this post on Ecosalon of various Etsy offerings for herb markers including the chalkboard style you liked (i believe Crate and Barrel also carries a simpler version). in addition to your herbs I also grow oregano (use it fresh and I dry it out), mint for mojitos and I have a huge rosemary bush which I cook/grill with constantly. Oh my, that is nice, but you have to get that mint out of there and into its own pot. It will choke out your other herbs. Love your herb markers. I planted my garden last week and had my husband bring home tongue depressors from the hospital. He whittled away a point at the bottom and I used a Sharpie to write the names. They are functional but not nearly as handsome as yours. I grow lots of basil for pesto. Thyme is my favorite and I grow lots of rosemary. Parsley, sage, cilantro and dill round out the garden. I don't have much room so i have just started small with mint, parsley & cilantro as I find these are the ones I use most in cooking. Its fun to see them grow bigger! Was just talking with someone today about starting an herb garden. I can never seem to use them all up when I buy them at the store - yet I love having them handy as they add such depth to a recipe. I need to plant my own!!! Oh my gosh! 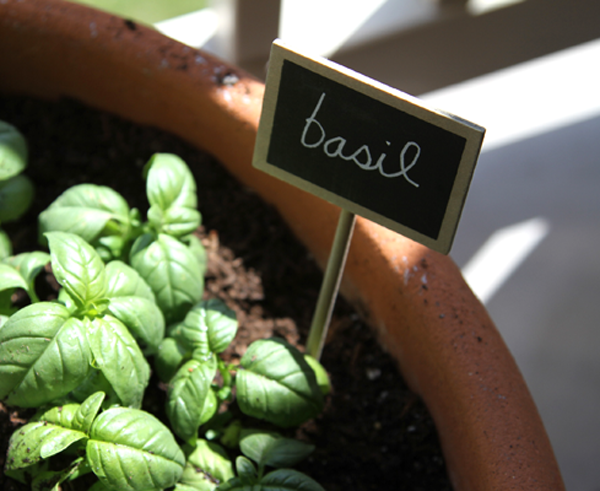 I just planted some basil (my favorite herb) in the ground the other day, but your pot is adorable! Those signs would be pretty easy to DIY too- I love it. Your herb garden looks great! Very classy! I have been wanting to plant some herbs but I keep procrastinating, I think I'm a little scared. Is that a 5 gallon pot you have them in? Love the signs as well! Awesome. When you searched the internet last year did you find any other cute signs? Love your blog! Thanks for the daily inspiration! I love the mini chalkboard labels!!! love those labels. so pretty and cute. I grow cilantro (for pico de gallo), mojito mint (for mojitos), basil (for pesto), and parsley (for tabbouleh). Yum! I have oregano, mint, chives, spinach and strawberries growing on my teeny windowsill. Thanks for all of your great tips -- I will have to transplant that mint right away. It is very fun to hear about all of your different varieties. This seems like the kind of gardening I can handle. I would plant in a separate pot as it spreads and it needs more water that the other herbs. But I love the tags and idea of a mix of herbs in such a pretty container. Mmmm...is there anything better than your own fresh herbs?? I just planted mine and am starting to harvest all the lettuce I planted...the spinach is amazing!! That is so pretty. My wife really wants to grow some herbs in our windows. Hopefully someday we'll have a some outdoor space for some true potting. When we moved into our house, it was taken over by mint. Now we've contained it to one area and we've also started growing basil (my fav), oregano, parsley and lavender from seeds. I can't believe how fast they've popped up! I love this! I have myself tried or lets say attempted to have a tiny windowsill garden of herbs for two years in a row. Lets just say my green thumb is turning brown itself from how bad I am... but I'm once again inspired.. lets hope I keep it up - thnx! Love this looks like my herb pot I got a massive round one...the chalkboards are a classic!